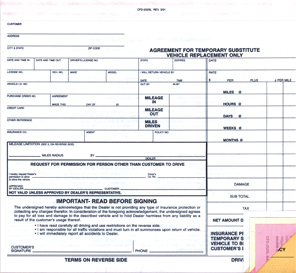 This generic rental agreement is for a temporary rental or loan of a substitute vehicle. This Basic form also includes an insurance protection disclaimer. Size is 8-1/2" x 7-5/8". 4 part, snap-out, carbonless - White, Canary, Pink, Goldenrod. Prints in black ink on face and gray on back. Packaged 100 per pack.